Detail of the printed design. Bone china jug with painted blue enamel bands to rim and handle, and a purple printed pattern within a molded frame on either side. The printed design appears to be a classical scene, to the right a well- dressed woman is seated at a table where she is presented with a bowl of fruit as servants attend. 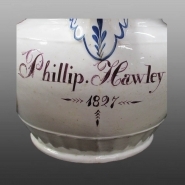 Beneath the lip is a purple enamel painted inscription reading Phillip Hawley 1827.